Pressure ulcers are a chronic healthcare burden for both patients and pro­viders. Over 2.5 million patients in the United States are affected annually by pressure ulcers, with nearly 60,000 of those cases directly resulting in death. From a provider’s perspective, the cost of individual care ranges anywhere from $500 to $70,000 per pressure ulcer, which translates to annual costs in the U.S. approaching $11 billion. Many of the complications caused by pressure ulcers occur with the most serious types—those in the stage III and IV category, which includes full-thickness skin and tissue loss. Frequently, stage III/IV pressure ulcers are a direct result of deep tissue injuries (DTIs). DTIs are caused by damage of subcutaneous tissue under intact skin due to pressure or shear that compromises tissue perfusion. The deeper the tissue injury, the more likely it will progress to a stage III/IV pressure ulcer. Since DTIs commonly present superficially and progress rapidly, early identification and treatment are important to reduce risk of complications. But early identification is challenging because of the delay between occurrence of a DTI and its appearance on the skin’s surface. And until recently, early interventions have been limited to off-loading and good skin care. 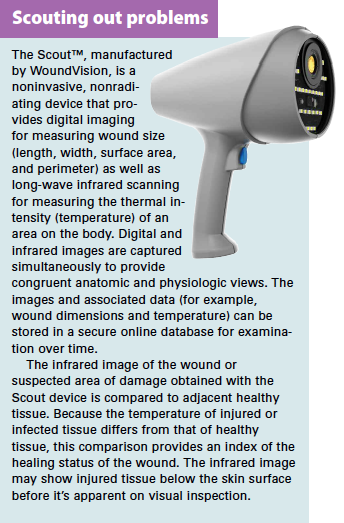 This case study demonstrates how two new technologies (infrared scanning with the WoundVision Scout™ and noncontact low-frequency ultrasound provided by MIST Therapy®) can be used to identify and resolve DTIs even in high-risk patients. Mr. Johnson*, a 57-year-old male who had experienced a spinal cord injury and vertebral artery dissection when he fell from a scaffold at work, was admitted to the Rehabilitation Hospital of Indiana (RHI) in Indianapolis about 8 months after his fall. His injuries resulted in tetraplegia, neurogenic bowel and bladder, frequent urinary tract infections, and orthostatic hypotension. Mr. Johnson’s admission to inpatient rehabilitation was delayed by his multiple medical problems. He was initially discharged from acute care to a skilled nursing facility, but required several acute-care rehospitalizations during the first 8 months after his injury. During his last hospitalization, he also developed a large stage IV sacral pressure ulcer, which was treated with negative pressure therapy. The ulcer was 90% healed when Mr. Johnson was transferred. Infrared imaging revealed a “cold” spot (relative to adjacent tissue) on the right upper buttock, although no changes on the skin surface were visible to the naked eye. (See Detecting a change.) A repeat scan confirmed the results, identifying a new suspected DTI (sDTI), which the clinician could palpate. The area of induration on the right upper buttock was 3 × 3 cm, and the location matched the infrared-imaged sDTI. The sDTI correlated to where the bend in a cardiac chair used during hospitalization would cause pressure to Mr. Johnson’s skin, so a DTI was confirmed. MIST Therapy is an evidence-based treatment for DTI that combines stimulation with noncontact low-frequency ultrasound (NLFU) and simultaneous application of a saline mist. Studies indicate that MIST Therapy removes barriers to healing by disrupting biofilm and reducing bacteria, inflammation, and matrix metallopeptidase 9. Treatment with MIST Therapy also enhances blood flow through vasodilation and angiogenesis, increases collagen deposition, and stimulates the release of growth factors. Mr. Johnson had daily noncontact treatments with MIST Therapy. Therapy was limited to 2 hours two times per day, and was done in a tilt-in-space wheelchair with a ROHO cushion. Each treatment session lasted 6 minutes, with the MIST device set at 30 to 90 cm2. A barrier ointment containing balsam of Peru was applied twice daily to the buttocks and peri areas, and the patient’s time in a wheelchair was limited. Mr. Johnson also got out of bed for showers and to use the bathroom as part of his bowel program. 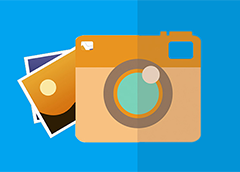 After 3 days, repeat infrared imaging found no signs of DTI, suggesting complete resolution. (See Resolution of deep tissue injury.) Before discharge, Mr. Johnson completed SCI Family Training with his wife, daughter, and son-in-law. He was discharged home with family and home health care to provide respite for his working wife. 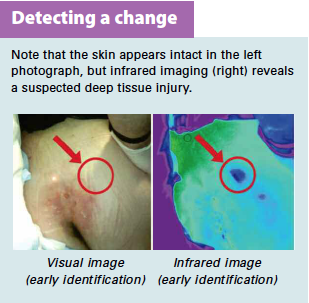 In this case, the combination of early identification provided by a camera with advanced infrared technology and early treatment with NLFU allowed for quick res­olu- ­tion of a DTI before evidence of the problem was visible on the skin surface. This quick action prevented an open pressure ulcer. The discovery of Mr. Johnson’s DTI illustrates that infrared scanning technology offers the possibility of routine examination of high-risk body areas in patients at high risk for occult DTIs. Early identification supports early intervention with state-of-the-science treatment technologies before the DTI becomes visible. At RHI, we are in the process of developing a protocol for routine infrared scanning of high-risk areas in patients with mobility impairments. The goal is to identify DTIs as early as possible to limit exacerbation and shorten required treatment time. This type of protocol should also help determine the frequency of occult DTIs and whether, with early intervention, rates of pressure ulcers and rehospitalization due to DTI can be reduced over a consecutive series of patients. Todd Zortman is a wound care RN/WCC and James Malec is research director at Rehabilitation Hospital of Indiana in Indianapolis. Haan J, Lucich S. A retrospective analysis of acoustic pressure wound therapy: effects on the healing progression of chronic wounds. J Am Col Certif Wound Spec. 2009;1:28-34. Haesler E., ed. National Pressure Ulcer Advisory Panel, European Pressure Ulcer Advisory Panel and Pan Pacific Pressure Injury Alliance Prevention and Treatment of Pressure Ulcers, Clinical Practice Guideline, Cambridge Media, Osborne Park, Western Australia, 2014. Langemo D, Spahn J, Snodgrass L. Accuracy and reproducibility of the wound shape measuring and monitoring system. Adv Skin Wound Care. 2015;28: 317-23. Langemo D1, Spahn J, Spahn T, Pinnamaneni VC. Comparison of standardized clinical evaluation of wounds using ruler length by width and Scout length by width measure and Scout perimeter trace. Adv Skin Wound Care. 2015;28:116-21.